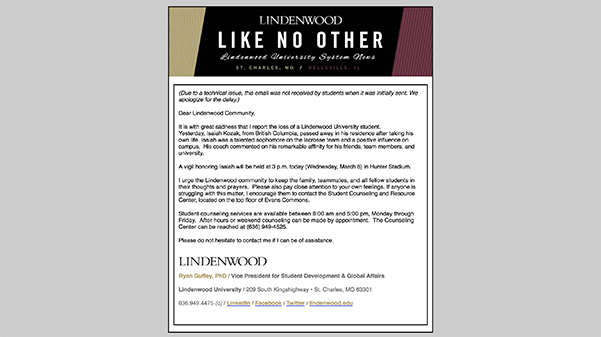 Lindenwood utilizes an email alert system to inform the entire campus about incidents on or around campus, but this semester there have been some technical difficulties that make the system somewhat ineffective. In January, a Timely Warning was sent out about a reported sexual assault, but students did not receive the email when it was initially sent out. Faculty received the email alert the afternoon before students did due to a technical issue. In March, a vigil was held for a student who had died suddenly. Students received notification of the vigil only 40 minutes before it was set to begin. This email came with a disclaimer that it was meant to go out earlier than we got it. If the email would have gone out when it was supposed to, students would have had more time to adjust their schedules to pay their respects to their classmate. I understand that the university is working to fix the problem, but that does not make it any less frustrating as a student to feel as if we are not informed. It is vital to know when something dangerous has happened in our area.St. Charles and our campus do not tend to be very dangerous areas, but any breach of safety can strike fear and anxiety into students. What is worse than this, however, is being unaware of dangers in the area. The emails come in handy with telling us where the incidents happened and often tips to stay safe. This could be incredibly important for students who live in those areas. I hope that we have seen the last of these mishaps. Some students did receive the March 12 alert about a reported break-in in campus housing, which makes me hope that the issue is finally on its way to being resolved. I understand it was an unexpected issue that the university had to react to, but as a student, I feel much more comfortable if I feel I am as informed as I can be.